Welcome to our Ischia blog, Good Morning Ischia! Here you can see the entry for Tuesday 24th December 2013. The people of Forio have been celebrating Christmas Eve in this way for many many years so I went down there this morning to see how it all unfolds. At the centre of the celebrations is a mass held in the main church, Chiesa di Santa Maria di Loreto. The mass is followed by a procession through the town square, led by the local clergy in full ceremonial regalia and followed dutifully by hundreds of townsfolk and a big brass band that plays carols and hymns. Even at 6am before the sun was up, the main square was packed with people giving each other Christmas greetings with hugs, kisses and handshakes and offering "auguri" (best wishes/seasons greetings) or "buone feste" (happy holidays). 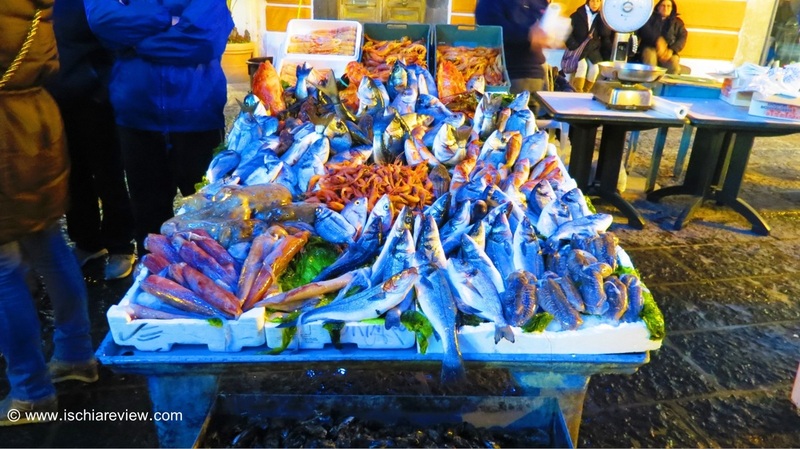 This same square has been transformed for the day into an impromptu fish market with the best of last night's catch available for those people who'll be cooking the traditional Christmas Eve fish dishes this evening. There were people offering pasta with beans (pasta con fagioli) and big fires burning to keep the early-morning visitors warm and then the climax with a wonderful firework display. Since then the sun has come up and the church bells have been constantly ringing out across the island creating the perfect setting for a festive Christmas. On most days I certainly wouldn't recommend waking up at such an unearthly hour but this morning in Forio was a truly memorable experience and a tradition that the people of Forio and the island of Ischia should feel very proud of. It's a unique tradition and celebrated with a real passion and enthusiasm that is striking and unforgettable. The rest of the day will be spent by most people doing their last-minute Christmas shopping (yes, you've guessed it, that does include me!) and then preparing for tonight's family meals with those beautiful fresh fish that were plucked from the sea just a few hours ago. At this stage I would like to offer my personal season's greetings to all readers of the blog, be they on the website or on our Facebook and other social networking pages, and to thank you all for showing an interest in what we're doing here on this wonderful island. I'll be back with a bit more tomorrow morning but in the meantime. Merry Christmas! Buon Natale and Tanti Auguri!! !